I'm running a new information service for people trying to make innovation happen in big companies, called Innovation Leader. Already, we've dived into how organizations like Intel, Google, Johnson & Johnson, Disney, GE, LEGO, and Walmart are trying to innovate better/faster/cheaper. In November 2015, we launched a print magazine to accompany the Innovation Leader website. 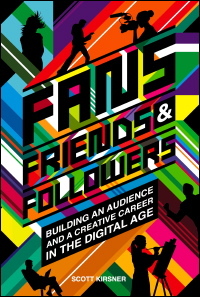 My most recent book, Fans, Friends & Followers, came out in 2009, and has been garnering some nice reviews on Amazon. It deals with one of the central challenges that creative folks face in these digital times: how do you cultivate an audience and a business model that will support your work? I interviewed several dozen filmmakers, musicians, visual artists, writers, and comedians who've been pioneers in this area, including documentary filmmakers Robert Greenwald and Sandi DuBowski, the animators behind "Red vs. Blue" and "Homestar Runner," humorist Ze Frank, and singer-songwriters Jonathan Coulton and Jill Sobule. The book collects some of their most successful strategies for building a fan base and a creative career online, and I've been giving book talks and workshops in L.A., San Francisco, New York, and the UK. 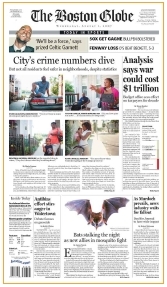 My blog Innovation Economy runs on BetaBoston, and my weekly column of the same name appears Sundays in the Boston Globe. They cover technology, life sciences, entrepreneurship and venture capital. My own tagline is "What's New in New England." I've had a long-standing connection with the Globe and Boston.com since 1995, when I was part of the team that initially created Boston.com; I started writing a regular column for the paper, then called "@large," in 2000. 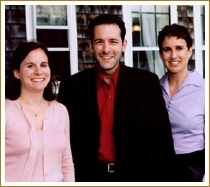 That's me with Alyssa Stern and Shayne Gilbert, the two people with whom I work on Future Forward and several other events. I speak at, host, and help organize a number of conferences and networking events in Boston and elsewhere. Right now, we're in the midst of putting together this year's editions of The Convergence Forum, a life sciences gathering that takes place in May, and the Nantucket Conference, a tech event that happens in June. I help develop the agenda for both events. If you're trying to contact me, that information is here. (E-mail is always best, unless it's exceedingly time-sensitive.) You can also follow me on Twitter: I'm @ScottKirsner.